Rinkmenos SVG peržiūros PNG dydisː 722 × 600 taškų. Kitos 5 rezoliucijos: 289 × 240 taškų | 578 × 480 taškų | 925 × 768 taškų | 1 233 × 1 024 taškų | 915 × 760 taškų. 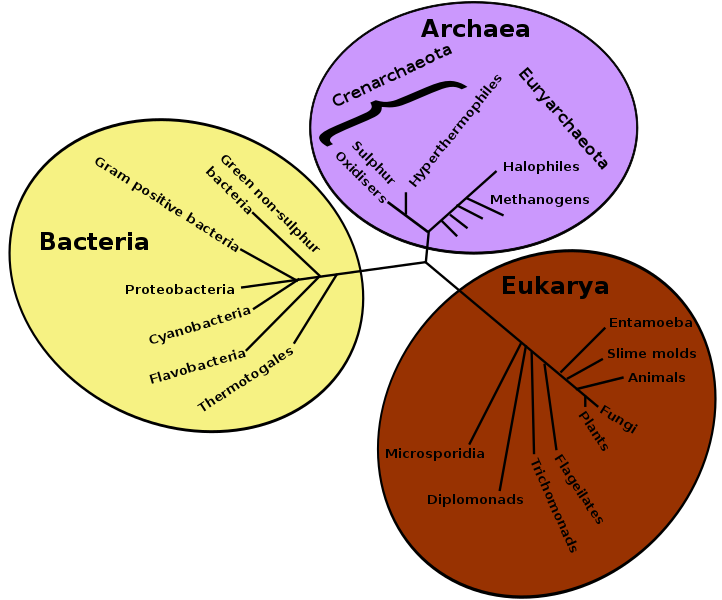 A phylogenetic tree of living things, based on rRNA data, showing the separation of bacteria, archaea, and eukaryotes. Trees constructed with other genes are generally similar, although they may place some early-branching groups very differently, thanks to long branch attraction. The exact relationships of the three domains are still being debated, as is the position of the root of the tree. It has also been suggested that due to lateral gene transfer, a tree may not be the best representation of the genetic relationships of all organisms. (Replacing en:Image:Tree_of_life.jpg) Original creator User:Samsara. Autorius No machine-readable author provided. Vanished user fijtji34toksdcknqrjn54yoimascj assumed (based on copyright claims).